1. Loaded Kimchi Fries: In large, nonstick skillet, heat 1 tbsp (15 mL) of the olive oil over medium heat; cook onion, stirring often, for 10 minutes or until softened and lightly browned around edges. 2. Stir in soy sauce, chili paste and sugar; cook for 2 minutes or until well combined. Add kimchi; cook for 6 to 8 minutes or until mixture is dark red and caramelized. 3. Prepare Superfries according to package directions; remove from oven and toss with remaining oil and paprika. Sprinkle cheese over top; return to 230°C oven for 3 minutes or until cheese is melted..
4. Transfer Superfries to serving platter or divide evenly among 4 plates. Top with caramelized kimchi, scallions and sesame seeds. 5. Hoisin Glazed Burger: Meanwhile, preheat grill to medium-high heat and grease grate well. Season beef with salt and pepper; gently mix to combine (do not overmix). 6. Form into 4 patties; create small indent in centre of each patty with thumb. 7. Whisk together hoisin, chili paste and sesame oil. Grill patties, turning once, for 12 to 15 minutes or until cooked to desired doneness. 8. Brush with hoisin mixture during last 2 minutes of cooking time. 9. 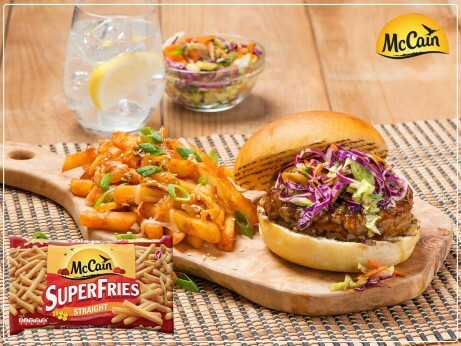 Top burgers with Asian Slaw and serve on rolls; serve Kimchi Superfries on the side. 1 Loaded Kimchi Fries: In large, nonstick skillet, heat 1 tbsp (15 mL) of the olive oil over medium heat; cook onion, stirring often, for 10 minutes or until softened and lightly browned around edges. 2 Stir in soy sauce, chili paste and sugar; cook for 2 minutes or until well combined. Add kimchi; cook for 6 to 8 minutes or until mixture is dark red and caramelized. 3 Prepare Superfries according to package directions; remove from oven and toss with remaining oil and paprika. Sprinkle cheese over top; return to 230°C oven for 3 minutes or until cheese is melted..
4 Transfer Superfries to serving platter or divide evenly among 4 plates. Top with caramelized kimchi, scallions and sesame seeds. 5 Hoisin Glazed Burger: Meanwhile, preheat grill to medium-high heat and grease grate well. Season beef with salt and pepper; gently mix to combine (do not overmix). 6 Form into 4 patties; create small indent in centre of each patty with thumb. 7 Whisk together hoisin, chili paste and sesame oil. Grill patties, turning once, for 12 to 15 minutes or until cooked to desired doneness. 8 Brush with hoisin mixture during last 2 minutes of cooking time. 9 Top burgers with Asian Slaw and serve on rolls; serve Kimchi Superfries on the side.